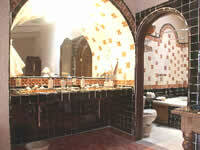 Tlaquepaque Hotel in Tlaquepaque - Quinta Don Jose Boutique Hotel in Tlaquepaque near Guadalajara: Quinta Don Jose is a great lodging option filled with service and comfort in the most important arts and crafts center in Mexico! 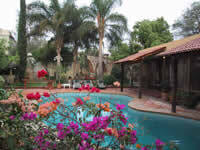 An Oasis of Tranquility in the Heart of Tlaquepaque! Quinta Don Jose Boutique Hotel offers you a beautiful relaxing setting and warmth in personal service that is unique to Mexico and its people. Tlaquepaque is Mexico’s Arts & Crafts Capital and QDJ brings you only steps from its superb shopping, galleries, museums, and inviting restaurants. We offer 15 rooms with private baths, air conditioning, Wi-Fi, cable TV, phone, courtesy airport pick-up service (2 night min) and more. 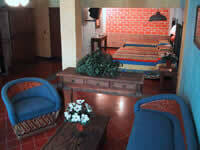 We have a full bar, tiled pool, and bilingual five star service! 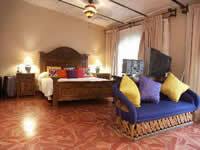 Located in the village of Tlaquepaque which is the arts and crafts capital of Mexico. The inn is within the historic old town district and walking distance from all points in the city. QDJ is only a 15 minute drive to the Guadalajara Historic downtown center and a 40 minute drive to the Lake Chapala area. The area is best known for its superb shopping as well as historic buildings from colonial times.